Delta Electronics' complete line of DIN rail power supplies offers industry-leading designs made to withstand harsh industrial environments, including products in accordance with ATEX requirements. The rugged aluminum or plastic case is both shock and vibration resistant according to IEC 60068-2. Features include overvoltage, overload, and overtemperature protections for the output. By using a wide input voltage range design, Delta's DIN rail power supply series is usable worldwide and features built-in power boost of up to 150% for 5 seconds. Such features enable reserve power to be always available for reliable startup of loads with high inrush current thus eliminating the need for a more expensive power supply at higher power rating. In addition, Delta's DIN rail add-on modules are designed to work seamlessly with Delta's family of power supplies to increase the operational reliability of the system with which it is connected. 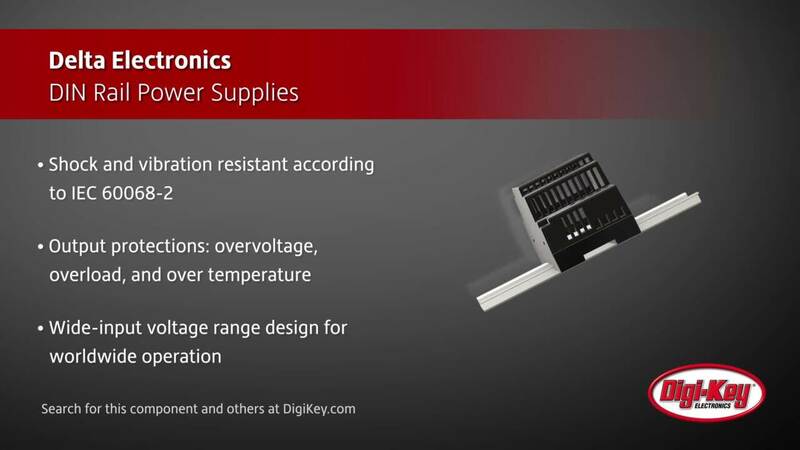 These products include buffer modules, redundancy modules, and DC-UPS modules, which can be used in most applications that can accommodate DIN rail power supplies. DIN Rail Power Supplies Created with industry leading design experience and state of the art manufacturing to create a product with a high performance-to-cost ratio and reliability. LYTE Series of DIN Rail Power Supplies LYTE series is designed for cost sensitive users, with essential features to fulfill the needs in general industrial applications.